Celtic band RUNA return to Circle of Friends on their 10th anniversary tour. Celtic band RUNA returns to the Circle of Friends Coffeehouse on Saturday, March 30th, at 8PM. 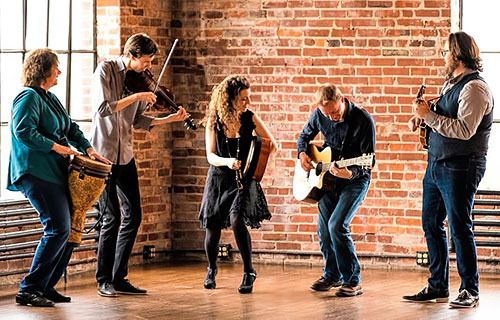 Quickly gaining recognition as one of Irish music's new "supergroups," RUNA has been enchanting audiences by pushing the boundaries of Irish folk music into the Americana and roots music formats since their formation in 2008. Interweaving the haunting melodies and exuberant tunes of Ireland and Scotland with the lush harmonies and intoxicating rhythms of jazz, bluegrass, flamenco and blues, they offer a thrilling and redefining take on traditional music. RUNA consists of vocalist and step-dancer, Shannon Lambert-Ryan of Philadelphia, Dublin-born guitarist, Fionán de Barra, Cheryl Prashker of Canada on percussion, Caleb Edwards of Nashville on mandolin and vocals, and Jake James of New York on the fiddle.